Local businesses are a valued part of the Ithaca community, with examples all over town of companies surviving based on the deliberate patronage of area residents who make a point of dropping by and showing their support. Until now, that had been mostly fueled by good will and a desire to resist the influx of chains and other faceless organizations mining the lucrative Ithaca market. But Hunter Friedland, a rising Cornell senior, wants to find a way to reward customers who eat and drink locally. Or, perhaps more accurately, he wants to Rewardzzz them. Friedland is a bright, excited student hailing from Miami, who’s come up with an idea to create a network of local businesses which can offer deals and, more importantly, points to customers using Friedland’s Rewardzzz system and app. Powered by blockchain technology, the program would accompany each purchase from an enrolled restaurant or bar (to start) by a customer also using Rewardzzz with a certain amount of points that can be collected and redeemed at other businesses in the network. After catching the spark of an idea in class, Friedland spent months calling around to businesses trying to find their most significant problems and concerns with reward programs, identifying them as convenience and value. By creating an ecosystem of businesses all insulated and operating on the same points system, Friedland said he thinks the value issue is solved. But convenience was the biggest obstacle to overcome, though Friedland and his team believe they’ve adequately addressed by turning to credit cards. Once the Rewardzzz app is installed on someone’s phone, the person enters their credit card information after a tutorial (the information is stored by a third-party firm called Stripe) and can begin automatically collecting points from any participating business where they make a credit card purchase, without any extra work during the transaction by merchant or consumer. In a world where people barely want to talk to a cashier anymore, being able to build points simply by swiping a card, without any other hassle on either end, is a very important aspect of the system. Friedland credits the Pillsbury Institute for Hospitality Entrepreneurship, Cornell’s eLab incubator and Blackstone LaunchPad, a consultation network for startups that recently opened at Cornell, with helping him during the development process. He’s working with some friends and other students based up here, as well as a technical development team located back in Miami. His father, a veteran of tech entrepreneurship, is mentoring him through the process as well. 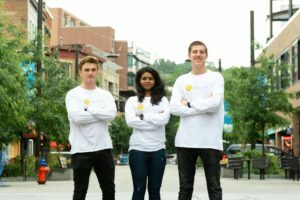 Through a first round of funding, Friedland raised $100,000, and if things go well, he and his team’s 50-60 hour work weeks will pay off with another small round of funding later this year before moving onto bigger figures if they find success.